Farmers make just 4.7 percent of the European Union’s working population but still contribute around 37 percent of the economy whereas in India agriculturists are around 58 per cent of its citizenry but their contribution to the economy is just 17.3 per cent. This reflects the stark difference in the farming practices of the both the sub-continents. Meanwhile Israel has apprised the world of new technologies that ensure maximum yield to the farmers in minimum resources and land mass. India that is facing various challenges with regards to lower productivity, resource crunch and erratic weather must cement its partnership with the advanced countries who have turned the agriculture into a profitable venture. The incumbent regime led by Prime Minister Narendra Modi has inked numerous deals with countries like Israel and Italy who are investing in technology and infrastructure building which in the end will benefit the Indian farmer. The government has shown its commitment by allocating Rs. 1.43 lakh crore for the existing schemes to boost agriculture production and rural economy. However, the Commerce Ministry under the guidance of Suresh Prabhu is also working actively to support agricultural sector with slew of measures in logistical support. The central government is also increasing funds on research and innovation to make agriculture sustainable. A report by Global Agriculture Forum states that one of the most critical issues for the farming community in India is availability of water. The government records and data available with credible agencies suggest that Indian farmers are among the biggest drawers of fresh water for their crops. Indian farmer uses 84-85 per cent of fresh water against the global average of 37 per cent. This has led to the depletion in water tables and many of the Indian blocks are hitting danger levels for quite a few years. Significant work is happening in this area to bring in modern technologies that will facilitate farmers to get maximum yield from the traditional crops from minimal use of water resources. The central government is also bringing new policies to double farmers’ income by 2022. Launch of ‘Operation Green’ with Rs 500 crore to assist farmers with logistics, warehousing, storage facilities is a positive step in this direction. Apart from that a bonus for ‘smart farmers’ managing their crop residue in eco-friendly ways reflect commitment of this government towards agriculturists. The government is also liberalizing export of agriculture commodities to meet farming sector’s export potential of Rs. 6748 crore in next fiscal year. Apart from emerging as the world’s largest producer of milk for the last two decades India has unfolded its strength to be an export hub of instant coffee after reaching 177,805 tonnes valued at Rs. 3,156 crore last fiscal year. Simultaneously the country has also topped the list of shrimp exporters globally, as the value-added shrimp exports rose 130 per cent year-on-year to 23,400 tonnes in 2017-18. India is also the second largest fruit producer in the world. India’s horticulture output, is estimated to be 287.3 lakh tonnes (MT) in 2017-18 according to advanced estimates. On the other side, India and Brazil have signed a bilateral investment agreement. The hard work being put in by the Modi regime is bearing fruits as the agreement in the two countries is aimed at enhancing cooperation in areas of agriculture, cattle genomics, primarily. India will also get a major chunk of investment from US-based company which is infusing an undisclosed amount in Bengaluru-based potato seeds firm. The joint venture will together produce high-quality mini-tubers in a tissue culture laboratory and multiply them in its own development farms. These seeds will be distributed in different regions of the country through supervised contract farming. Meanwhile Israel Prime Minister Benjamin Netanyahu during his last visit also expressed commitment to strengthen bilateral relations in the field of agriculture and allied sectors, as well as enhance cooperation at the government-to-government and business-to-business levels between the two countries. The two countries will collaborate in coconut farming, coffee plantation and cereal crops. With all these policies and efforts in place, India is expected to achieve the ambitious goal of doubling farm income. 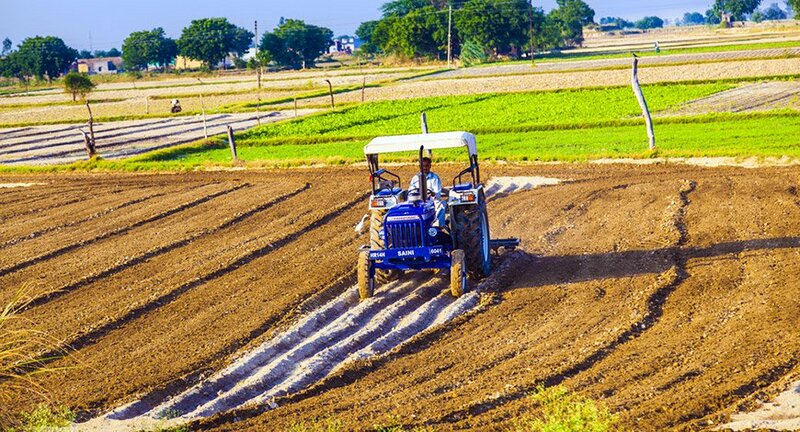 The agriculture sector in India is expected to generate better momentum in the next few years due to increased investments in agricultural infrastructure such as irrigation facilities, warehousing and cold storage. India is expected to be self-sufficient in pulses in the coming few years due to concerted efforts of scientists to get early-maturing varieties of pulses and the increase in minimum support price.